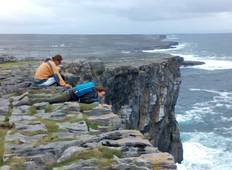 Find the right tour for you through Burren National Park. We've got 8 tours going to Burren National Park, starting from just 3 days in length, and the longest tour is 13 days. The most popular month to go is August, which has the most number of tour departures. "Michael was awesome and his love for his country was evident. He was good with giving..."
"This tour is a good combination of history and geography. Michael is so knowledgeable..."
"This Trip to Ireland arranged by Indus Travel was Incredible, no glitches, very smooth,..."
"This is the most accommodating tour company around. Thank you for a wonderful, once..."
"Great tour! We had a wonderful time with Michael and JB on our tour. They accommodated..."